TEACHERS ~ We have 50+ seats available for Wed. Jan. 30th screening. If you have a smaller groups, than you can book together with the other groups and get the discounted price. We have 400 seats so larger groups can also be accommodated. Just complete the booking form. Filmmakers follow nine high school students from around the globe as they compete at an international science fair. Facing off against 1,700 of the smartest teens from 78 countries, only one will be named Best in Fair. 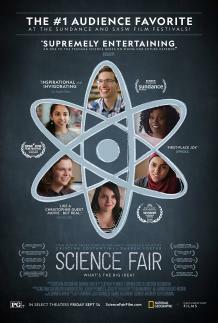 "You don’t need to know your endothelial cells from your amygdala to fall in love with “Science Fair,” an ebullient documentary about high school students competing at the International Science and Engineering Fair, known as ISEF. It’s a “Mad Hot Ballroom” for the science-club set, but thanks to an endearing cast of characters, it's also a total crowd-pleaser. Upbeat, optimistic and idealistic, it's a snapshot of a generation that may yet usher in a brighter, better future. Running through “Science Fair” is an egalitarian theme: A good idea can come from anybody, anywhere. Cliché as it sounds, the students seem to genuinely value the fair itself more than the prizes they might win. It’s the annual ISEF dance party, a high-spirited gathering of roughly 1,700 brainiac teens of all colors, creeds and genders, that best sums up this winning film."